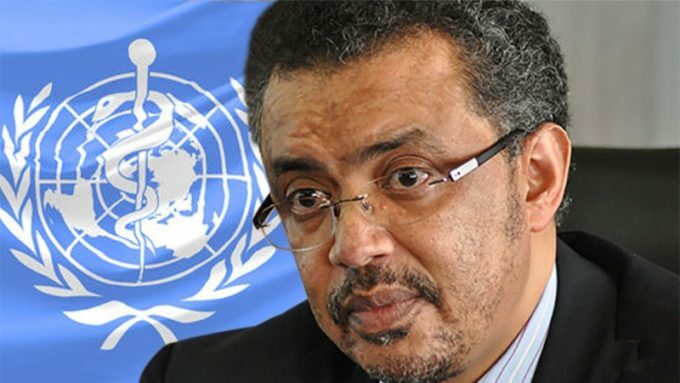 Dr. Tedros Adhanom Ghebreyesus, the British-educated Eritrean-Ethiopian physician and politician who heads the World Health Organization, a UN agency. United Nations photo. At 5:45 a.m. last Friday morning, I received a message from Michel Zaffran, my colleague who is the director of polio eradication, informing me of the shocking news that two polio workers, a mother and daughter, had been shot dead in Pakistan. It was the first message of the day, very early in the morning. I was deeply saddened, and I couldn’t believe the text message I was reading from my colleague. It is an outrage that a mother and her 16-year-old daughter could be murdered while trying to protect the health of children. It’s really saddening, and as I said, an outrage. Unfortunately, it is not only them. In the first three quarters of last year, 44 health workers were killed while doing their jobs, trying to save and protect the lives of others. This will not derail us from eradicating polio, or from the services we give to save lives. It will only strengthen our resolve to fight even harder. Please stand with me for a minute’s silence as we honor their sacrifice. This is a special year in many ways. It’s a year of opportunities. First, it’s WHO’s 70th birthday — an opportunity to celebrate past successes and rethink our future. It’s also the 40th anniversary of the Alma Ata Declaration — an opportunity to reaffirm that people-centerd primary care must be the foundation of our efforts to achieve universal health coverage. And it’s the 100th anniversary of the Spanish flu pandemic — an opportunity to remember the devastating potential of outbreaks if we are unprepared for them. As you know, Spanish flu 100 years ago killed more people — 50 to 100 million — than the First World War. But it’s also a year of opportunity for WHO. It’s the year that will determine what WHO looks like in the future. For the past six months, my team and I have been working every day to strengthen the foundations of the Organization. We have worked tirelessly to develop the General Program of Work. Many of us didn’t even take a break during the long vacation. We have developed a plan to transform WHO. We have begun work on revamping resource mobilization. And we have built a strong leadership team, with enormous talent and experience. For the first time, we have achieved gender parity in WHO’s top ranks, with women outnumbering men, and with more geographical diversity than ever before. This is very historic. Of course, all this work is closely connected. We cannot implement the GPW without transforming WHO, or without resources, or without strong leadership. That’s why I say we’re laying the foundations. That’s what we’ve been doing the last six months. The GPW, the transformation, resource mobilization, strong leadership: these are the foundations. But even as we have strengthened the foundations, we’ve been getting on with the day-to-day work of the Organization. We’ve built strong political momentum on noncommunicable diseases and TB, which will both have high-level events at the United Nations General Assembly later this year. We have established a new High-Level Commission on NCDs. We have launched a new initiative to combat the health effects of climate change in Small Island Developing States. We’ve signed new agreements with the World Bank, UN Environment, the United Nations Framework Convention on Climate Change and others. We have started a new process of engaging with civil society organizations to amplify our collective voices. It’s the collective voice that is more potent than the fragmented one. And we finished the year with the UHC Forum in Tokyo, where we witnessed unprecedented political commitment in support of our vision of health for all. I want to particularly thank the government of Japan and His Excellency Prime Minister Abe, not only for hosting that important meeting, but for their commitment to spend $2.9 billion advancing UHC globally. The UHC monitoring report, launched in Tokyo, also reminds us of the task at hand. At least half the world’s population still lacks access to essential health services. And almost 100 million people are pushed into extreme poverty every year because of out-of-pocket health spending. But there are signs of hope. Just 12 days ago I had the honor of meeting President Uhuru Kenyatta in Nairobi, Kenya. As you may know, His Excellency recently announced that affordable healthcare would be one of the four pillars of the Kenyan economy for his second term in office. He wants WHO’s support. In our meeting, he asked me to help his government to identify the best financing model to achieve his vision. And he wants it fast — he gave me just three months! That shows his commitment. It was the same story in Madagascar, where the government has just created a National Health Solidarity Fund, which it is now starting to roll out in three districts. And it was the same story in Rwanda, where I visited the Mayange Health center, just outside Kigali. In that area, all pregnant women deliver in the health center. All children are vaccinated. And everyone is enrolled in the community-based health insurance scheme. These rates are rare, even in countries that are far wealthier than Rwanda. My time in these three countries reminded me that universal health coverage is not a pipedream. It is a reality in many places. Each country I visited was at a different point in its journey. But they have a common destination. This year, universal health coverage will be the theme both for World Health Day and the World Health Assembly, as you know. I’m pleased to announce that we will celebrate World Health Day in Sri Lanka, which is also celebrating its 70th birthday. I’d like to use this opportunity actually to say to Sri Lanka, happy 70 years of independence. There is no more fitting place for this event. As you know, Sri Lanka has a long history of providing free healthcare for its people. This year we also plan to issue a challenge to all countries to take at least three concrete steps towards universal health coverage. I’m starting by issuing that challenge to you. We have here in the room board members and non-board members. But in the coming days, I will be sending a letter to every head of state, asking them to join the Global Challenge on UHC, the same question that I’m asking you: three concrete steps. I’m asking you, because I’ve seen a degree of commitment that I didn’t see during the G20. And I propose that when we meet again at the Assembly in May, as many countries as possible come ready to make commitments about the action they will take in the next 12 months with regard to UHC. I am more convinced than ever that UHC is not only the best investment in a healthier world, it is also the best investment in a safer world. As you have heard me say, universal health coverage and health security are two sides of the same coin. In the past six months, WHO has responded to 50 emergencies in 48 countries, including 9 grade 3 emergencies — the highest level. I now receive a daily briefing note summarizing all ongoing emergencies, and our response to them. We have set up a dashboard with near-real time data on outbreaks and emergencies. And we have established the Health Security Council in WHO, a fortnightly meeting co-chaired by Peter Salama, my Deputy Director-General and myself, which reviews all emergencies in detail. No single day passes actually without me focusing on emergencies. We’re trying to run emergencies as a national security council runs. It’s a daily business. During my trip to Madagascar, I visited a plague treatment center where I met an 8-year-old boy called Aine. He survived narrowly because he was diagnosed and treated early. But more than 200 other people were not so lucky. To be exact, 207 people have died. It could have been much worse. The transmission season started earlier than usual. It spread in endemic and non-endemic areas. And it was the highly contagious pneumonic form of plague. It was a dangerous combination of factors. It was a surprise attack, started earlier, spread in endemic and non-endemic areas and it was pneumonic. A dangerous combination. But swift action by the government, supported by WHO and all our partners, helped to bring the outbreak under control very quickly. The transmission season continues until April, so we just remain vigilant. But at the same time, we cannot sit back and wait for the next season to begin. We must be prepared for an even worse outbreak later this year. That’s why I was very encouraged that the President of Madagascar has agreed to allocate funding to fight plague, to show his commitment by strengthening sanitation and vector control, so that we attack first. Because if we are truly to make the world safe, we must shift towards a greater emphasis on preventing emergencies, rather than merely reacting to them. Prevention — we have to strike first. We shouldn’t wait until the beast strikes. And when outbreaks do strike, we must be ready. That’s why we are now mapping the capacities of all countries to contribute to a global “health reserve army” that can be deployed rapidly to respond to emergencies. Once that mapping process is finalized, we have agreed with GOARN, we will come back to ask you to commit as many people as possible, and to fund their deployment wherever they are needed in the world within 72 hours. This will effectively constitute a large stock of in-kind support stationed in many countries around the world, human resources and finance, and represents a new mechanism of resource mobilization: resources in-kind. At the same time, we must strengthen the capacity of countries to enable them to both prepare for and respond to emergencies. Doing that must likewise involve strengthening WHO’s country offices. We must ensure they have the resources, the tools and the permission to do their jobs to the best of their ability — strong delegation of authority. We must give them the right people, in the right jobs, with the right resources to deliver on the “triple billion” target. In each of the three countries I visited recently, I was so impressed and inspired by our hard-working, talented WRs and our country-office staff. They are the true stars of our WHO. We must empower them to do even better. Of course, with increased responsibility comes increased accountability, and we will ensure that our country offices are kept to high standards of performance and accountability. But if we are to achieve any of this — if we are to advance universal health coverage; if we are to address emergencies; if we are to put countries at the center — WHO must change. In the past six months, I have made a priority of developing a plan to transform WHO into the Organization that the world needs it to be. Our goal is clear – to make WHO a modern organization that works seamlessly to make a measurable difference in people’s health at country level. Reaching this goal requires a shared vision, mission and strategy. We have to be aligned on those. It requires overhauling our core business processes — from planning to procurement and recruitment, which you know are very, very slow — to make sure they deliver rapidly and predictably. Most importantly, it requires a change of culture. A change of mindset. Recently we asked all 9,000 staff globally to complete a survey to help us “take the temperature” of the Organization. What came back was encouraging. But it also highlighted several areas requiring major improvement. It showed that we must do better at communicating our vision and strategy throughout the Organization, and involve staff in setting goals. At the same time, there must be more accountability for performance. More work is needed to motivate staff to do their best – they need more ownership, and opportunities for training and career development. And we need to create a culture of transparency and collaboration that empowers our staff. These findings are a strong reality check. I am taking them very seriously and I am already acting on them. We will rapidly strengthen our performance management to ensure every staff knows their role and is accountable for their performance. It all begins with clear expectations from the staff. These findings are also a reminder that we can write a great GPW, but we need a great WHO to make it happen. That’s why the GPW and the transformation plan must go hand-in-hand. We cannot do one without the other. That’s why I said these are very important foundations. And we cannot do either without continually, rigorously and transparently monitoring our progress. For this we will have a balanced scorecard to ensure we take a holistic approach to driving all major aspects of WHO’s strategy and transformation. We have an intensive 18 months of change in front of us to become the WHO that you want, and that the world needs. The transformation process will be targeted and time-limited. The transformation team will then itself transform into a unit that drives continuous improvement within WHO and moves us from an organization that simply “serves” to one that “serves and thinks”. Here too we need your support. If we are to truly change the way WHO operates, we need as much flexible and un-earmarked funding as possible. There is now growing support from many of you. If we continue to operate under the same funding restrictions, we will produce the same results. No organization can succeed when its budget and priorities are not aligned. I know the trust deficit we have between WHO and the Member States. We will do everything to address the trust deficit we have. But we would like you to help from your side. As I said at PBAC last week, the GPW is fundamentally about vision. It’s about imagining the world we want, and asking what sort of WHO we need to make that world a reality. This is not a job for the secretariat alone. We can only do this together. And third, for WHO, to commit to un-earmarked funding so we can truly put countries at the center, and drive progress towards the Sustainable Development Goals. My visit to my own continent Africa a couple of weeks ago reminded me why I campaigned for this job in the first place: people. The people of Kenya, Rwanda and the whole world for that matter, who deserve our best efforts to promote health, keep the world safe, and serve the vulnerable. I take you back to what woke me up last Friday. A reminder for me to remember every day. That there are people out there who are giving more and getting nothing. The mother and child who sacrificed themselves to save others. These are the people who remind me of the purpose of our work, and the purpose of my own well-being. The shock is still in my heart. I was so saddened. But it’s also a reminder that we have a bigger purpose. Thank you so much. Let’s remember this mother and her daughter, 16 years old. They’re the best.